I was born in New Zealand in 1962 and moved to Australia when I was 24 years old. I didn’t know then that it was to become my home, but like so many Kiwi’s I have put down my roots here. Brisbane became my home but it was here that I met and married another Kiwi and we have 2 boys. They might be Aussies, but the genes are definitely NZ. People have often asked what made me start making guitars. The answer is connected to my upbringing. I loved playing the instrument but couldn’t afford a good one. So in 1988 I decided to have a go at making my own. As a child I had pretty much grown up in my Grandfather’s workshop, where he had built nearly every item of machinery in it! He had been an aircraft engineer on “Tiger-moth’s” before WW2 and had a fairly unique qualification of being able to fully dismantle both airframe and engine, then rebuild the aircraft and fly it. He was a man who had a very good eye for detail and I remember being taught well that there was always a correct way to do something. Many times he would ask me to tell him what a measurement was without referring to the ruler, and then he would check it after we had “cast our votes”. So at age 7, I was building things, or pulling them apart wanting to know how they worked. That didn’t mean I could put them all back together again, but it was how I ticked. I guess I was much like my grandfather and remember spending many hours playing with bits of wood and metal that he would patiently help me fashion into a boat or plane etc. He was, you could say, my first mentor. So, after researching as much information as I could, (which wasn’t much in 1988) I proceeded to carefully build my first guitar. In those days there was no such thing as a kit containing pre-shaped parts etc, so everything was built from scratch using a minimum of tools. I went on to build one after another, each time learning more and adding my new insights to each instrument. All my early guitars, though somewhat rough around the edges, are still in use and play very well. 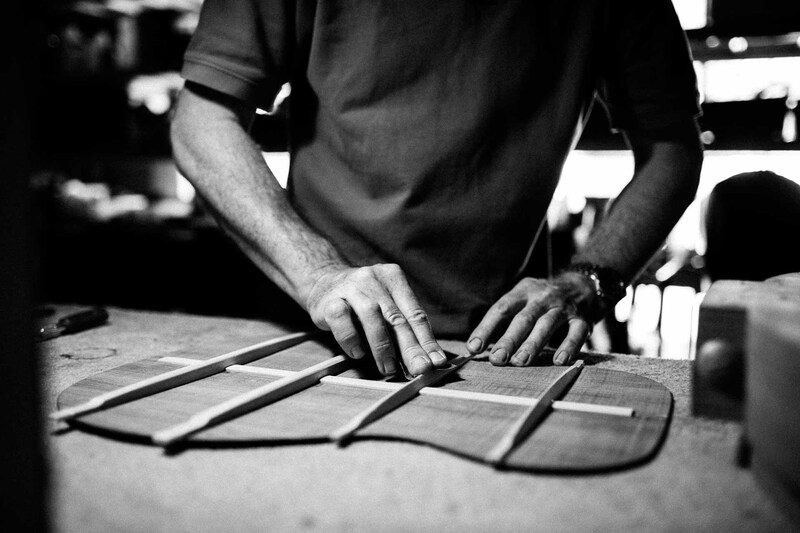 But it was hard to make a living building handmade guitars in Brisbane, Australia in those early days. A few years later I was offered a job with a local repairer and electric guitar builder by the name of Chris Kinman. One of the things I discovered from working with ‘CK’ was the difference between good and excellent. Chris or ‘CK’ was obsessed with attention to detail. Close enough wasn’t good enough. It had to be perfect! Over the next 6 years I worked on all the major US brands, both acoustic and electric, along with quite a few handmade guitars from other builders both in Australia and the US. For someone who always wanted to know ‘how things worked’, it was the perfect training ground. I was able to understand the strengths and weaknesses of different guitars, and assess the implications of various construction styles and how each ‘family’ sound was achieved. I can remember spending two solid days just testing the sonic qualities of red alder, shaped, but unfinished Strat bodies. CK would painstakingly test each body for it’s inherent musicality so it could be graded accordingly. Fast forward six years and CK had invented a new noiseless Stratocaster and Telecaster pickup. These pickups, by the way, are quite incredible. (Check out www.kinman.com) With him wanting to head in that direction, I left to begin Melville Guitars. I have now been building and repairing guitars full time for 30 years and have pretty much seen, played, repaired, prodded, poked and inspected, most of what is available. For me, the combination of building and repairing works well. I love the ‘problem solving’ and variety of repair work, and I get the privilege to work on and learn from, guitars that are part of the history of the instrument. For me, building guitars is where I’m able to take all that knowledge of what works, and what doesn’t work, and apply it to building my own guitars. So it’s not just understanding the aesthetics of fine woodworking, or how to achieve the ‘perceived’ ultimate sound, but being able to construct an instrument that will last a lifetime and continue to delight the player every time they pick it up. As a child I had pretty much grown up in my Grandfather’s workshop, where he had built nearly every item of machinery in it! He had been an aircraft engineer on “Tiger-moth’s” before WW2 and had a fairly unique qualification of being able to fully dismantle both airframe and engine, then rebuild the aircraft and fly it. He was a man who had a very good eye for detail and I remember being taught well that there was always a correct way to do something. Many times he would ask me to tell him what a measurement was without referring to the ruler, and then he would check it after we had “cast our votes”. So at age 7, I was building things, or pulling them apart wanting to know how they worked. That didn’t mean I could put them all back together again, but it was how I ticked. I guess I was much like my grandfather and remember spending many hours playing with bits of wood and metal that he would patiently help me fashion into a boat or plane etc. He was, you could say, my first mentor. 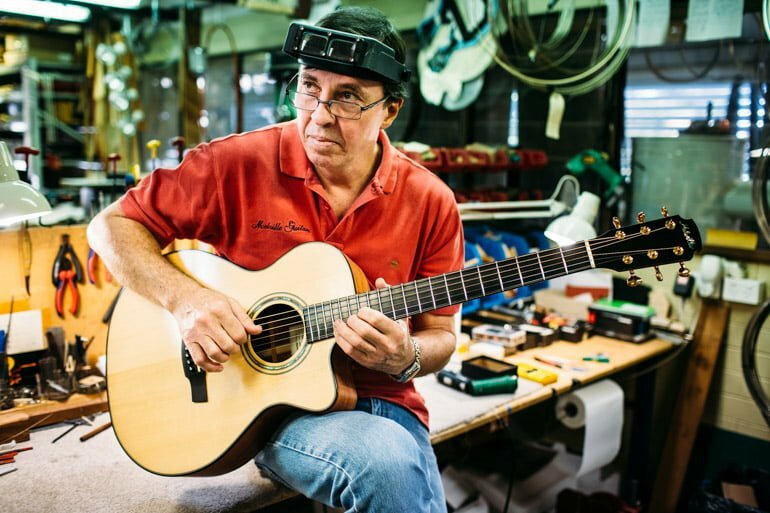 Over the next 6 years I worked on all the major US brands, both acoustic and electric, along with quite a few handmade guitars from other builders both in Australia and the US. For someone who always wanted to know ‘how things worked’, it was the perfect training ground. I was able to understand the strengths and weaknesses of different guitars, and assess the implications of various construction styles and how each ‘family’ sound was achieved. I can remember spending two solid days just testing the sonic qualities of red alder, shaped, but unfinished Strat bodies. CK would painstakingly test each body for it’s inherent musicality so it could be graded accordingly. I have now been building and repairing guitars full time for 30 years and have pretty much seen, played, repaired, prodded, poked and inspected, most of what is available. For me, the combination of building and repairing works well. I love the ‘problem solving’ and variety of repair work, and I get the privilege to work on and learn from, guitars that are part of the history of the instrument. For me, building guitars is where I’m able to take all that knowledge of what works, and what doesn’t work, and apply it to building my own guitars. So it’s not just understanding the aesthetics of fine woodworking, or how to achieve the ‘perceived’ ultimate sound, but being able to construct an instrument that will last a lifetime and continue to delight the player every time they pick it up.